Well since Josh trumped me on “Lady” I better respond… Cale Leiphardt presents this lovely Reading B4a steam shunter. The stickers are very high quality too. 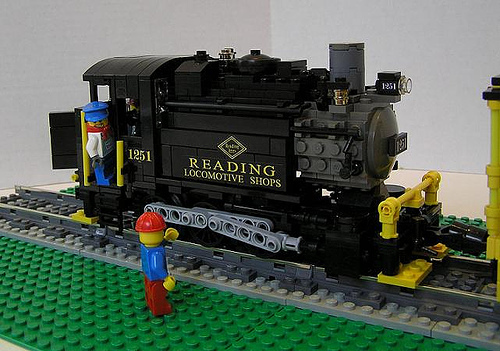 I’m not sure I’ve blogged Cale here before but he has an impressive range of 8-wide steam trains made out of Lego. His style is quite original and highly successful. I’m a sucker for short and squat (hey, I have a pug), so I love this one. Nice find, Tim!